Blancmange today is an old-fashioned sweet dessert, a white pudding. In the Middle Ages however it could also be a savoury dish, made with almond milk and the white meat of chicken or fish. The blancmange on this page is made with crayfish (or crawfish for the Americans). I have to confess to a small subterfuge to be able to use crayfish in this recipe. The Middle English text mentions lopuster (lobster). In the glossary of Two fifteenth century Cookery-Books (edition Austin) it says at the lemma Creue¥ (crayfish): “It includes Lobsters” (p.126). So, crayfish can be lobsters. Whether it can also be the other way around I’m not sure, but I like the decoration with crayfish so much. 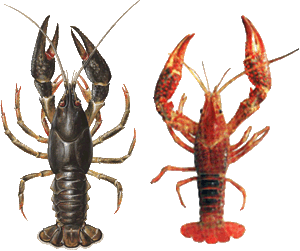 The crayfish used in fourteenth century England would have been European crayfish, Astacus astacus. But, sad to say, the European crayfish is now endangered, and a protected species. Not only pollution of its habitat threatens the crustacean, but also the invasion of exotic species like the North American crayfish (Orconectes limosus), the Danube or Galician crayfish (Astacus leptodactylus) and the red swamp crayfish (Procambarus clarkii). I made my blancmange with the last one, imported from a Chinese fish farm. In the Middle Ages native crayfish were still plentiful. According to the German text Wie man fisch und vögel fahen soll (How to catch fish and birds) from 1493 (edition) they were at their best in March and April, especially during waxing moon. They could however be eaten as late as July. This is how they were caught: “Item nim ein pocks leber vnd prat die vast woll. Nach dem praten so bestreich sy mit dem bereiten gaffer. Darnach mit ein netzlyn von einem kalbe oder schoffe daz frisch ist vnd schlag das netz vmb die leber. Darnach pint die leber vff ein pretlin als du kanst. Dar mit fachestu krepps vnd visch on zale.” (Take the liver of a billy goat and roast it very well. After roasting spread it with prepared camphor. Then take a fresh caul from a calf or sheep and wrap it around the liver. Then tie the liver on a little board as best as you can. With that you will catch innumerable crayfish en fish – Translation by Richard C. Hoffman, except for netzlyn, that I translated with caulinstead of peritoneum). There are no less than five Middle English cookbooks with this recipe: Diuersa Servicia from the fourteenth century (edition Hieatt and Butler, see bibliography), Liber cure cocorum and two more manuscripts from the fifteenth century (Harleian ms 279 en Harleian ms. 4016, editie Austin), and the first printed cookbook in English from 1500, A noble boke of festes ryalle and cokery, which I haven’t been able to find (anyone …?). 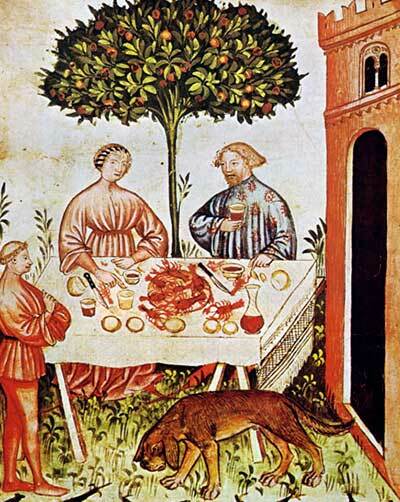 The four recipes from the manuscripts all resemble each other greatly, only the Liber cure cocorum leaves out any mention of lobster and uses other fish, and Harleian ms. 279 is the only manuscript that mentions ginger. here you find the version from Diuersa servicia, because that is the oldest (1381), and just for fun the version from Liber cure cocorum (1460), because it rhymes. The original text below should show a particular symbol, the letter thor (þ), that looks like a p and b combined. This represented the English ‘th’-sound in the Middle Ages. On the keyboard it can be reproduced by using ctrl-alt-t. But if your pc or browser does not recognize the symbol, you’ll see something else altogether, I can’t help that. For to make blomanger of fysch, tak a pound of rys. Les hem wel & wasch, & seþ tyl þey breste & lat hem kele; & do þereto mylk of to pound of almandys. Nym þe perche or þe lopuster & boyle yt, & kest sugur & salt also þerto, & serue yt forth. To make blancmange of fish, take a pound of rice. Clean and wash it well, boil until they (the grains) break, and let cool. Add milk of two pounds of almonds. Take perch or lobster and boil it, and cast sugar and salt in also. Serve it forth. Tyl þat þey brostene; and lete hom kele. And messe hit forthe before godde men. Until it breaks, then let it cool. Tench or lamprey you’ll add last. Then serve to good men as well as you may. The adaptation is based on Diuersa servicia, but I have allowed myself some major liberties. 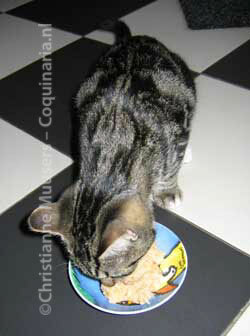 I have chosen to prepare the almond milk with stock, made from the shells of the crayfish that are used in the recipe. This results in a delicate taste. And I have added the ginger mentioned in Harleian ms.279. First course, side dish or lunch for 3 to 6 persons; preparation in advance 1 hour; preparation 30 minutes. Shell the crayfish, don’t forget to crack the claws if they are fleshy. Put the meat in the refrigerator. Save four whole crayfish or heads with claws for garnish (also: refrigerator). Rinse shells well under the tap, and drain. Use a third of the shells to prepare the stock for the almond milk, but use the rest to make this concentrated crustacean fumet you can freeze. Heat olive oil in a pan, fry (as I said, a third of) the shells at high temperature for a minute, then add five decilitres water. Let simmer for 45 minutes, strain the resulting stock. When making the blancmange with fish, poach the fish preferably on the bone and with skin, fillet when it is done. Save three decilitres of the strained cooking liquid. Use the cooking liquid (or use fish fumet or crustacean fumet) to make almond milk: steep the (freshly) ground almonds for twenty minutes in the hot liquid. Then strain through a cloth, be sure to press the almond pulp to get as much almond milk as possible. Chop the crayfish meat. Don’t forget to remove the intestine first, unless you get a kick out of eating crayfish poo. Put meat, rice, sugar, salt and ginger in a skillet, and add enough almond milk to moisten the rice. Heat over a low fire until the almond milk has been absorbed or evaporized. If you want to, you can use a blender to purée the rice, but this is not necessary. Line a pudding mould with plastic foil, scoop in the blancmange, and let it cool to room temperature. Or line small cups or soufflé moulds with plastic foil to get individual portions. Demould the blanc mange on a dish. Use whole crayfish, or the heads and claws, to garnish. You can also use flowers or herbs. Just not slices of lemon. Lemons were an extreme rarity in fourteenth century England. You could serve this blancmange with a sauce made from cream, reduced with Noilly Prat and a spoonful of crayfish fumet. Not medieval, but quite delicious. Cats will love this blancmange too. If you refrain from adding salt, and used ginger sparingly, this dish can be given without any qualms. That is to say … Hiro gobbled it up, but his mother Clio wrinkled her nose and tried to bury the dish under the kitchen tiles. Cats have just as individual tastes as humans. There are mainly two kinds: the river lamprey (Lampreta fluviatilis), and the sea lamprey (Petromyzon marinus). In Dutch there is a third animal that is called lamprei, it is used to designate a young rabbit. The mouth of the fish has inspired many science-fiction film makers in the design of creepy aliens. Modern blancmange is a sweet dish for dessert. A couple of examples for Blancmange in Dutch cookbooks from the nineteenth and early twentieth century: Rijstvla, a custard with rice, sugar and milk, garnished with lemon peel (Maria Haezebroek, De hedendaagsche kookkunst, (1851) 2nd edition, p.117), and Blanke Roompudding, a white pudding with cream, milk, sugar, vanilla, gelatine and almond biscuits (C.H.A. Scholte-Hoek, Het nagerecht bij huislijke dineetjes. Deel I, 1935, p.36/38). The francocentric Larousse Gastronomique (at least, my Dutch edition) defines blancmange as a ‘kind of jelly made with almonds’. The Oxford companion to food describes the Anglosaxon version as ‘a sweet jellied dessert made from milk and cornflour, to which flavour and colour[!] are often added’. Blancmange is not to be confused with bavarois. That dessert is made with egg custard or puréed fruit, cream and gelatine. Rice is associated primarily with Asian cuisine. The grain is indeed indigenous to Asia, but was introduced in Europe as early as 327 BC by Alexander the Great. However, it remained a curiosity for a long time. Exactly one recipe with rice can be found in the Roman cookbook De Re Coquinaria, pounded as thickener for a sauce for meat balls. It wasn’t until the conquest of the Iberic paeninsula by the Moors in 711 AD that rice was introduced as a crop. It would take another seven centuries before rice was grown in Italy, in the Po Valley. In Spain as well as Italy both short and middle long grain rice was grown. Thomas Austin, Two Fifteenth-Century Cookery-Books (Early English Text Society Original Series) . Harleian ms.279 (ab.1430), & Harl.ms.4016 (ab1450), with extracts from Ashmole ms.1439, Laud ms.553, & Douce ms.55. Reprint Oxford University Press, 2000, digital edition). C.B. Hieatt en S. Butler, Curye on Inglysch (Middle English recipes) (Early English Text Society Supplementary Series) , Londen, 1985. This also contains Diuersa servicia. Richard C. Hoffmann, Fishers’ Craft and Lettered Art: Tracts on Fishing from the End of the Middle Ages (Toronto Mediaeval Texts and Translations) , 1997. Richard Morris, Liber Cure cocorum, copied and edited from the Sloane ms. 1986. Asher and co., Berlin, 1862. 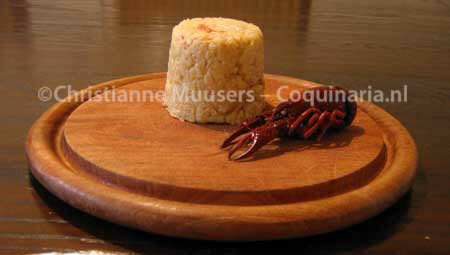 An English recipe for a blancmange with rice and fish or crayfish that can also be served in a modern menu.